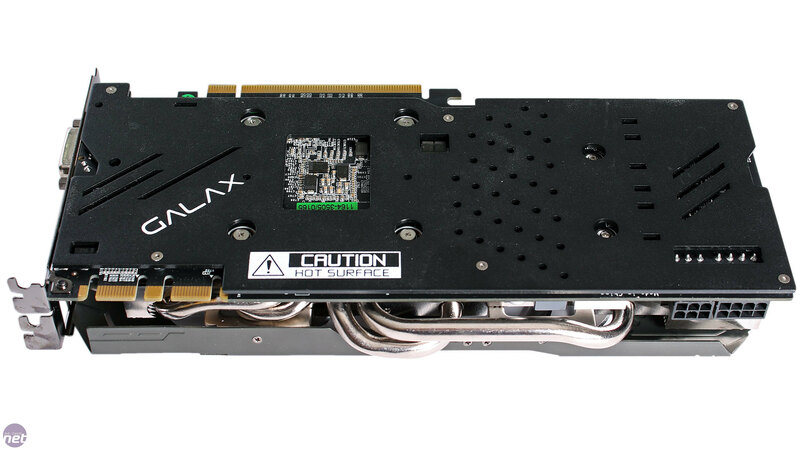 We first saw a product from Galax – the unification of Galaxy and its EU brand, KFA2 – in the form of the GTX 980 SOC, and it was a solid offering at that. Today, we're turning our attention to one of its GTX 970 offerings, specifically the EXOC Black Edition. 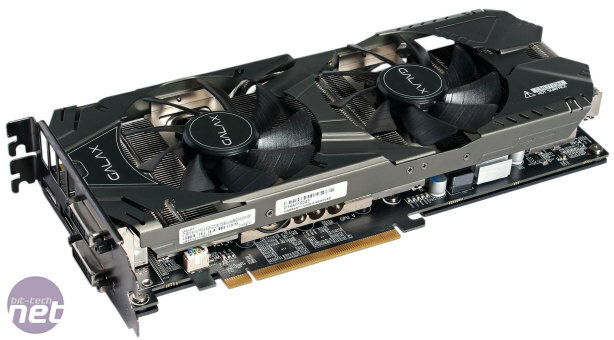 Prices for the GTX 970 start at just £240 now, but this one from Galax will set you back £260. That extra £20 buys you a factory overclocked GPU and a custom cooler, though that applies to the majority of GTX 970s on the market since there's no true reference design. The pricing means the Galax card undercuts our current favourite GTX 970, the MSI GTX 970 Gaming 4G, by just under £10, so it's off to a good start. The grey and black colour scheme is hardly the most exciting, but it's also inoffensive. The fan shroud is also made of metal rather than plastic, which helps to bolster the overall build quality. 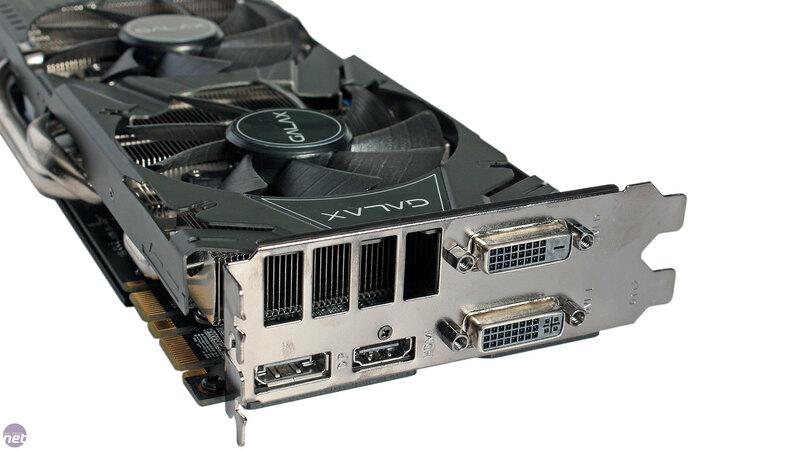 The GTX 970 EXOC Black is also relatively compact – the specs list it as 271mm long but that includes the PCI bracket, so the length you'll need to accommodate in your case is closer to 260mm. The thicker heat pipes do poke out at the top too, but only just, so they're unlikely to be problematic in many cases. Flipping it over reveals a thick and rigid metal backplate, designed to support the card against its own weight while also providing some aesthetic benefit. Various holes through this backplate should allow air to circulate in cramped SLI situations, but actual heat dissipation will be limited since there's no direct contact with the PCB or rear memory chips. 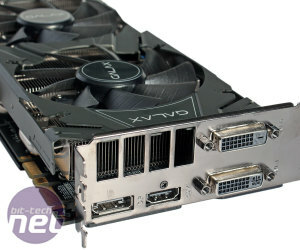 The display outputs are the same as the other three GTX 970s we've seen. It's a shame not to see greater use of DisplayPort, but equally it's still a modern and useful selection, and a DVI to VGA adaptor is provided for those keeping it old school. A dual molex to 6-pin PCI-E power and dual molex to 8-pin PCI-E power cable are also provided, since the card draws power from a top-mounted 6-pin/8-pin combination. This is the same as the MSI GTX 970 Gaming 4G, which proved to be the best overclocker in our initial roundup – hopefully the extra power is beneficial here too. Naturally, two SLI connectors are also found, enabling up to 3-way SLI. 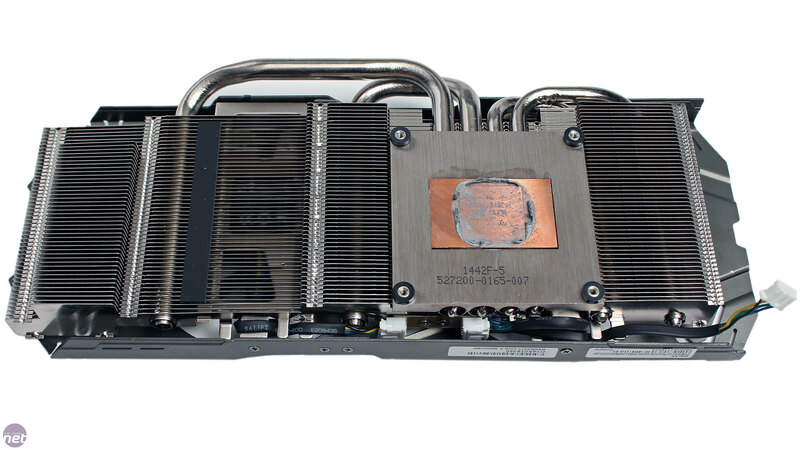 The “EXOC” in GTX 970 EXOC stands for Extreme Overclocked. The card ships with a base clock of 1,165MHz (1,317MHz boost), which along with the EVGA GTX 970 SC ACX2, is the joint highest on factory clock speeds we've seen. However, it's not the highest available, and even Galax has a higher clocked card, the awesome looking white GTX 970 HOF. The memory is left at the stock speed of 7GHz effective – it's a shame there's no overclock but this is the case with the vast majority of available GTX 970s. Since the cooler shroud is open, most hot air will be exhausted into your chassis, though some will also pass directly out of the rear I/O panel thanks to the large vents there. A pair of fans is responsible for airflow, though unfortunately there's no independent fan control or a semi-passive mode available. The main heatsink comprises four heat pipes (two 8mm, two 6mm) soldered to a copper contact plate and feeding a full length aluminium fin stack. This is similar to MSI's Twin Frozr V cooler, though it's not the same heatsink – MSI's is wider with different shape heat pipes and larger fans. None of the eight memory chips are directly cooled, but the MOSFETs do have their own small heatsink attached. The PCB reveals seven main power phases, which is two more than the reference design specifies, but one less than MSI's. There are also no specially designed power components used as there are on the MSI GTX 970 Gaming 4G and the Asus Strix GTX 970, but that's not to say the components here are bad. 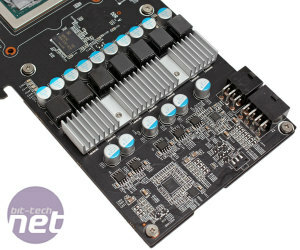 The eight memory modules are split evenly between the front and rear of the PCB, and are the same Samsung 4GB GDDR5 chips as always with the GTX 900 series.